Hiab, part of Cargotec, presented the world's first electric powered skiploader concept vehicle at the Freight in the City Expo, London, in partnership with Dutch electric vehicle manufacturer EMOSS. This fully-integrated electric solution matches the load handling capabilities of a diesel skiploader truck. "At Hiab, as part of our ongoing commitment to sustainability, we have developed, in partnership with EMOSS, a 100% electric concept truck featuring the latest-generation MULTILIFT Futura 12 skiploader and an ePTO (electric Power Take-Off) solution. As it operates silently and with no CO2 or nitrogen oxide emissions, this fully-electric skiploader is ideal for businesses that involve urban deliveries or out-of-hours operations," says Henri Janhonen, Director, Sales and Product Business Management, Demountables, Hiab. Together with the skiploader, Hiab also presented the HIAB loader crane with an ePTO at the Freight in the City Expo, London as well as the MOFFETT E-Series truck mounted forklift, which is the world's first lithium-ion powered truck mounted forklift and is completely emission free. The ePTO loader crane was launched on the market in 2014 and the MOFFETT E-series the year before. 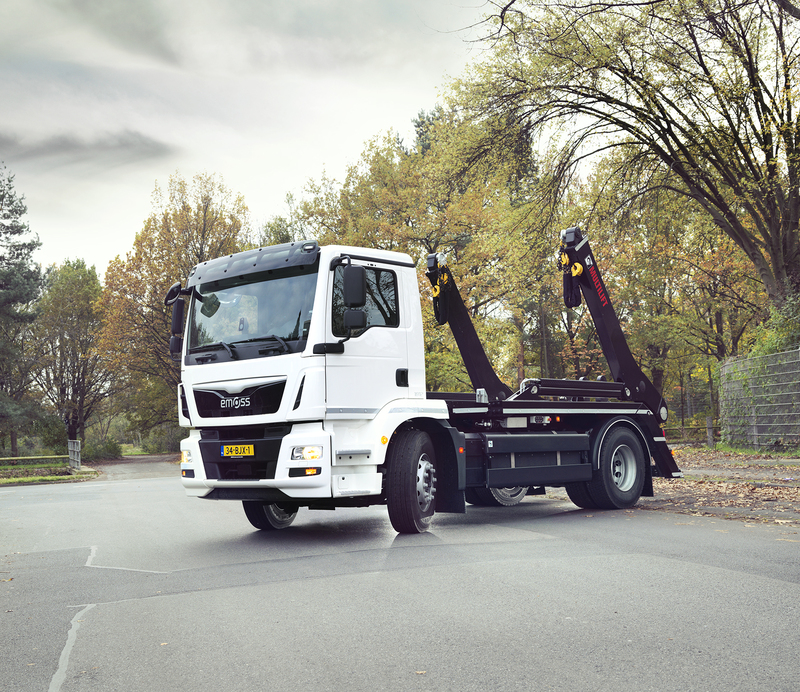 "The pioneering spirit at Hiab is never idle; and as the demand for more environmentally-friendly and emission-free products grows, we want to stay in the driver's seat. We know that our customers are facing a tougher and more demanding load handling environment, especially in the larger cities, with emission regulations not easing the demand for logistics. Legislation is demanding it and our customers' customers want it. In order to stay customer focused we presented these three fully to partially electric product and product combinations at the Freight in the City Expo," says Keith Quigley, Senior Vice President, Truck Mounted Forklifts, Hiab. Recently, Hiab, together with its UK-based customer Pets at Home, was awarded the Noise Abatement Society's Quiet Logistics Award, also known as the "Noise Oscars", for their partnership approach to reducing noise associated with out-of-hours deliveries. As Pets at Home often works with night-time deliveries, the emission-free and silent MOFFETT E-Series truck mounted forklift enables them to enhance their night-time deliveries, saving money on fuel, reducing their carbon footprint and no longer being a nuisance to the neighbours of their stores. For this major investment in low-noise technology to reduce environmental noise and improve customer service, the quiet delivery partnership of Hiab and Pets at Home won the John Connell Quiet Logistics Award 2017. "Rules and regulations to limit noise and exhaust emissions have already been established in some cities. Congestion charges are already a reality, and additional fees for exhaust emissions are likely to be set in the near future. Furthermore, limitations exist for nigEmissions (noise or pollution). These limitations will steer truck operators towards the usage of electric vehicles in densely populated areas. At Hiab, we want to be fully prepared for the growing popularity of electric trucks, and also be the preferred partner for load handling solutions in the future," continues Mr. Janhonen.